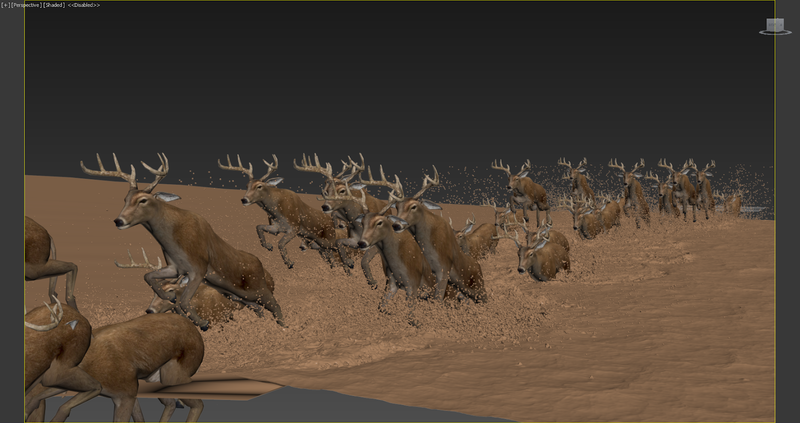 In this article, I am going to share some tips & tricks of how I made this deer crossing river animation. 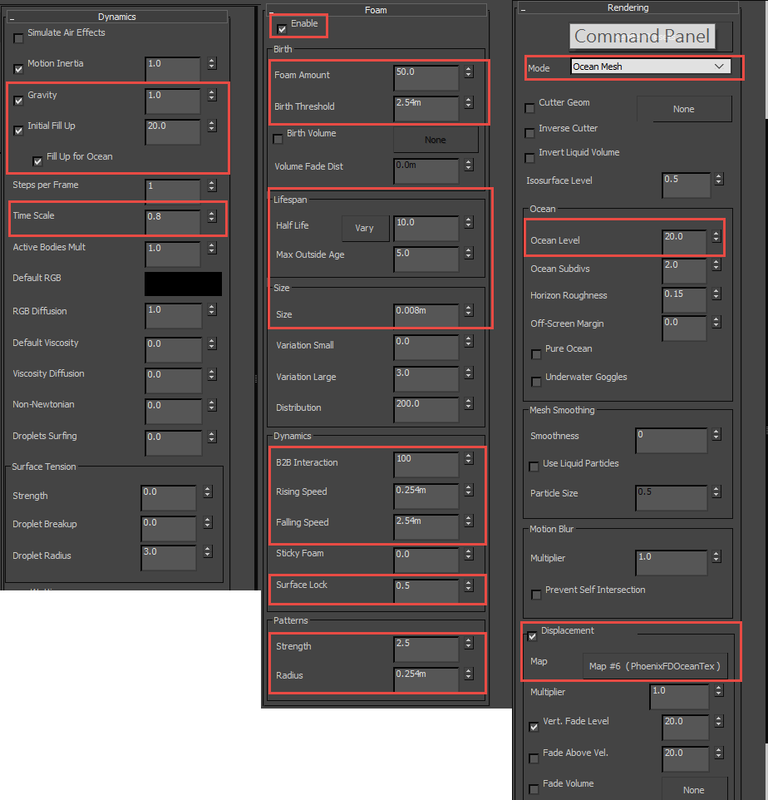 Although it might look daunting at first glance, the settings for Phoenix are quite simple. The most critical thing for making this animation is the hardware. 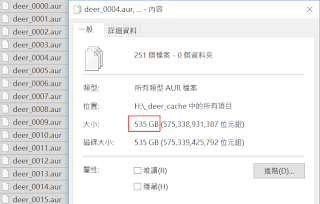 As you can see, the total cache size for the whole animation (250 frames) is around 535 GB. 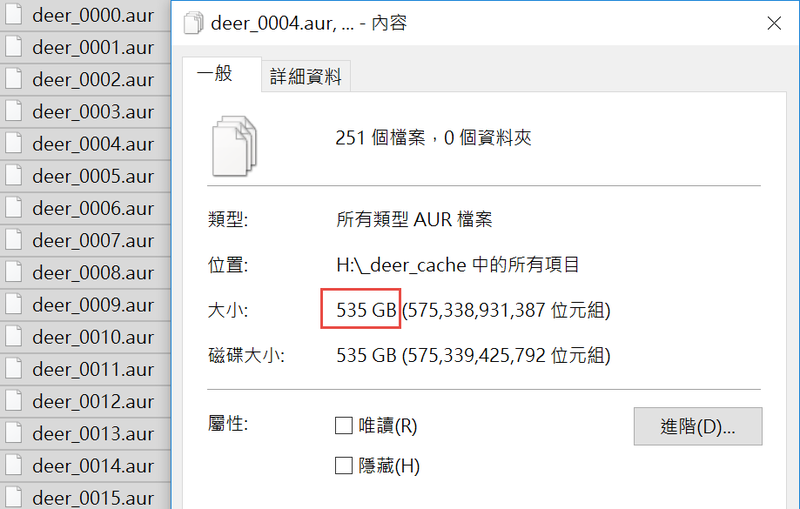 So you better have a faster RAM and a hard drive with enough space for this kind of project. Once you have your hardware ready, leave it to Phoenix, Don't worry, Phoenix FD does support large-scale fluids like this one. 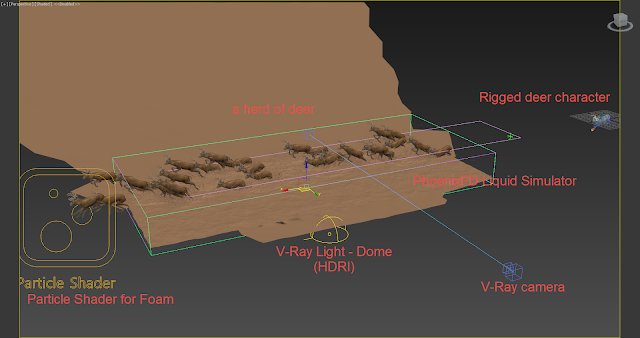 The image above shows my scene setup. The herd of deer is generated from a single rigged deer, duplicated by using thinkingParticles. 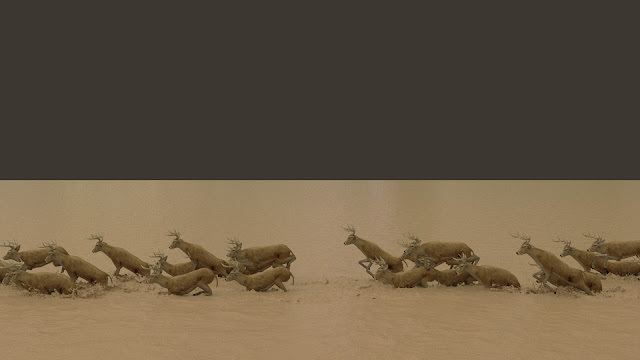 There is no animation variation of the deer character, so the setting is simple, only offsetting animation for each deer. 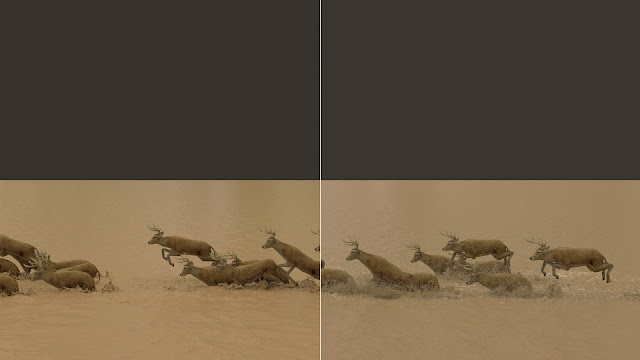 Phoenix FD Liquid Simulation grid: Note that I keep my simulation grid very narrow, just wide enough to cover the region where the deer are crossing the river. Remember, the smaller the grid - the faster the simulation. For other parts of the river, we will use 'Ocean Mode' in combination with displacement and no simulation will be involved. Phoenix FD will extend the liquid mesh from the camera frustrum, so you will see deer crossing river as if the river is infinitely large from camera view. Everything I do here is to make sure simulation is highly optimized and can be simulated efficiently. 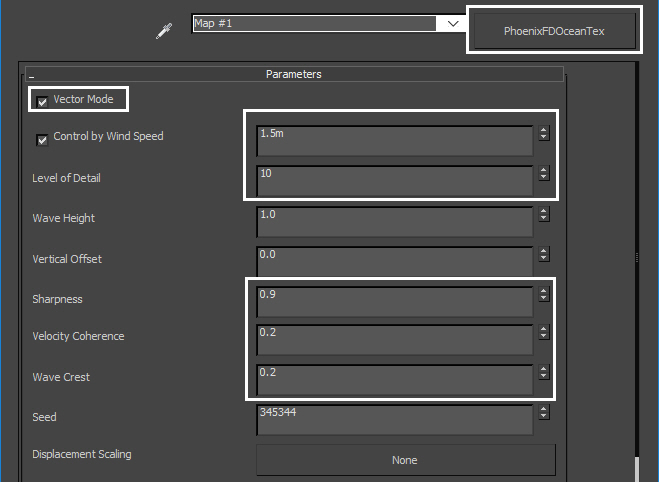 Above are shown the settings for Dynamics, foam and rendering. 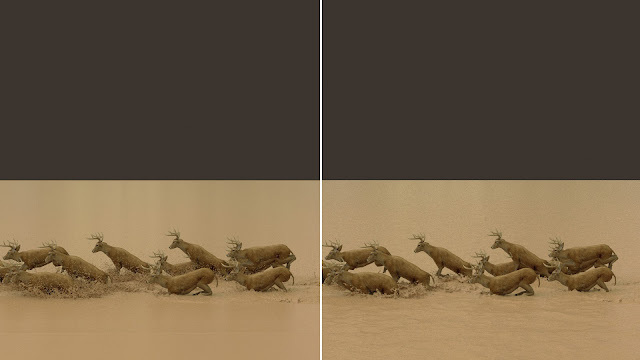 I set the depth of river, the "Initial Fill Up" to 20, a value that is just enough for the deer to create beautiful splashes. Yet, the body of water is not too large, otherwise it will take a longer simulation time. Reduce the Time Scale option to 0.8 for aesthetic reasons. Check the Foam option. This will allow Phoenix FD to generate and simulate foam particles when the deer are crossing the river. In the rendering section, switch to "Ocean Mesh" mode. Set the "Ocean level" to the same value as "Initial Fill Up", which is 20. 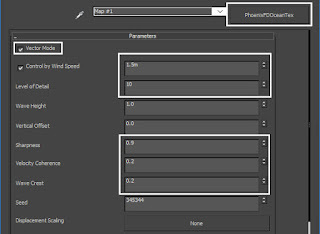 Plug in a PhoenixFDOceanTex in the Displacement Map slot. This will add details to our river surface. Follow my setting as above. Our goal is to create a relatively calm but with some fine ripple surface over the river. After you tick the Foam option of your Phoenix FD Liquid Simulator, Phoenix will automatically create a Particle Shader in the scene. In this helper object, we can set the color, size, even multiply the number of the foam. Since this is a muddy river, we set our foam color to light brown color.